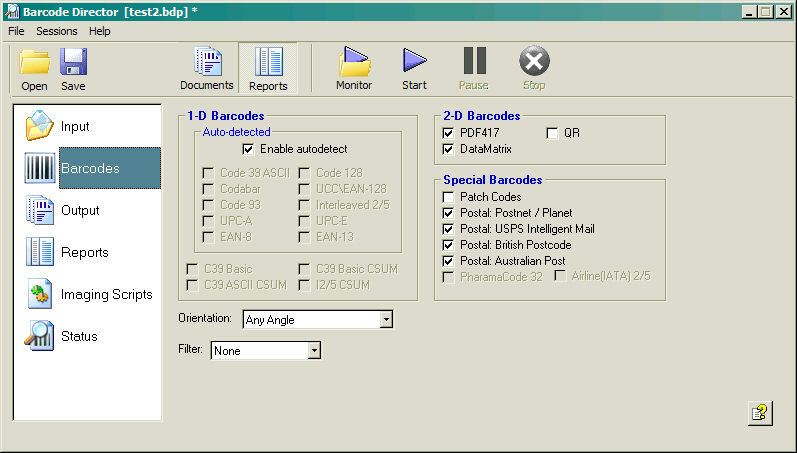 Panel specifies barcode types and characteristics to be searched for in Reports Mode. Specify barcode types (or symbologies) and optional characteristics (variation and checksums) to be searched for. Barcodes types are grouped in 1D, 2D and Special Barcodes for the purpose of clarity. Some type of barcodes are mutually exclusive and checkbox is greyed when exclusive type is checked. Note: Session processing time depends on the number of selected types. Select only types you are really interested in. If you know types of 1D barcodes uncheck Enable autodetect. Select orientation of expected barcodes. If not known select Any Angle.